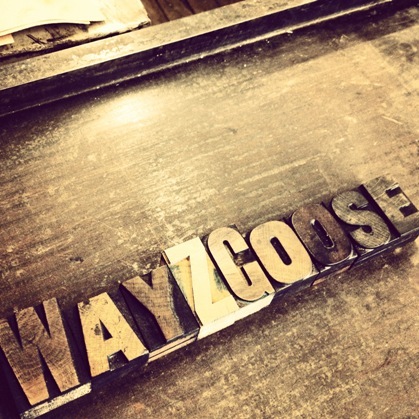 We are having a Wayzgoose Print Fair on Saturday 27th & Sunday 28th June. Doors open between 11am & 5pm. It’s free entry so please just turn up! There’s so much happening. We will be taking over more of the first floor. There will be specially created shops selling printed goods and lots of artists’ stalls selling prints and cards. We will have a big print sale in the main room and free demonstrations throughout the weekend. So far, featured artists will include : Nell Smith, Lesley Pangburn, Christine Towers, Barbara Helm, Kiran Williams, Jan Slater, Wendy North, Sam Horsley, Irena Przybyl, Nikki Darham, Loretta Venters, Jo Wolkinson, Claire Batt and Elizabeth Willow. This is our fundraiser which will go towards our ambitious plans to buy the building. Any money raised will go towards equipping the new and improved facilities. The more money we raise the better equipped we will be. We are even having a cake sale. There will be new posters and t-shirts printed, aprons and cards specially commissioned. Come along. All are welcome. Tell your friends.